Pharmacy garden with medicinal plants with their own hands - what to plant and how to equip? | | A site about a garden, a summer residence and house plants. Pharmacy garden with medicinal plants with their own hands - what to plant and how to equip? Just do not say that you do not have them. Look around. Really, there are no Echinacea, violets, lungworts, badans in your garden; in the garden does not grow dill, parsley, garlic, onions, mint; there are no bushes of black currant, dog rose, raspberry, sea-buckthorn; and around the house there are no rowan, willow, lime trees and you do not pester at all, nettles, dandelions? That's just the point, that medicinal plants are everywhere. It's great that today we have modern medicine for our services, but often heal a cut or inflammation from an insect bite, stop blood in the wound, calm the loosened nerves, rinse your throat, make a healing bath or a pleasant face mask, make a fragrant tea or make a delicious tincture much easier and faster from the fact that it grows literally under your feet. 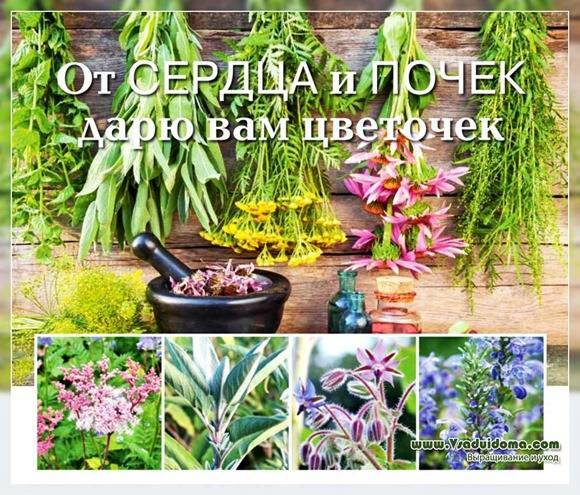 Before you select a plot for medicinal plants in the garden, decide what you want to get: environmentally friendly medicinal plants; a variety of spicy herbs and useful and tasty greens to the table; a collection of aromatic plants? In any case, many plants are able to perform all these tasks, but your needs will depend on the location, quantity and range. If you intend to grow, collect and actively use medicinal herbs (St. John's wort, oregano, sage, motherwort, elephant, chamomile), you will have to give them a significant area and focus on drawing on the possibility of proper cultivation, not decorativeness. And most importantly - the environmental situation around the site. 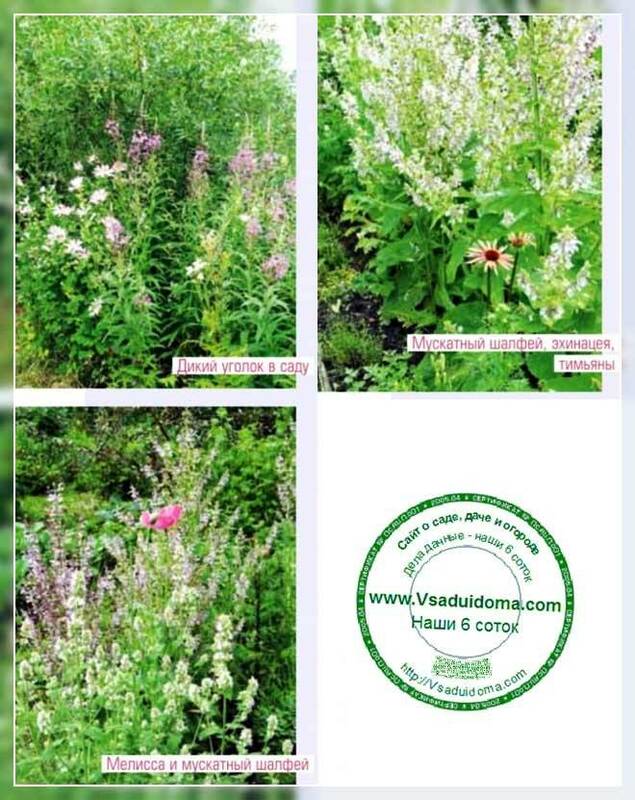 If it is located near the highway or industrial plants, then the idea of ​​growing your own medicinal herbs, unfortunately, will have to be abandoned. 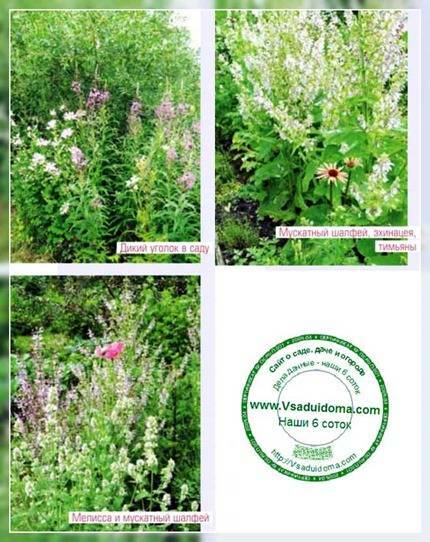 To attract useful and scaring harmful insects, the plants (bud, clover, marigold, wormwood, rue, marigold, phacelia) should be planted around the perimeter of the garden or dispersed between fruit trees, bushes and vegetable beds. Kitchen garden is arranged closer to the kitchen. And a set of medicinal and spicy herbs in it corresponding: anise, parsley, dill, basil, coriander, hyssop, lemon balm, mint, oregano, thyme, cumin, tarragon, sage, onions, borage, lavender. Many of this list can be grown in containers. And not only at the dacha, but at home - on the balcony and even on the kitchen sill. 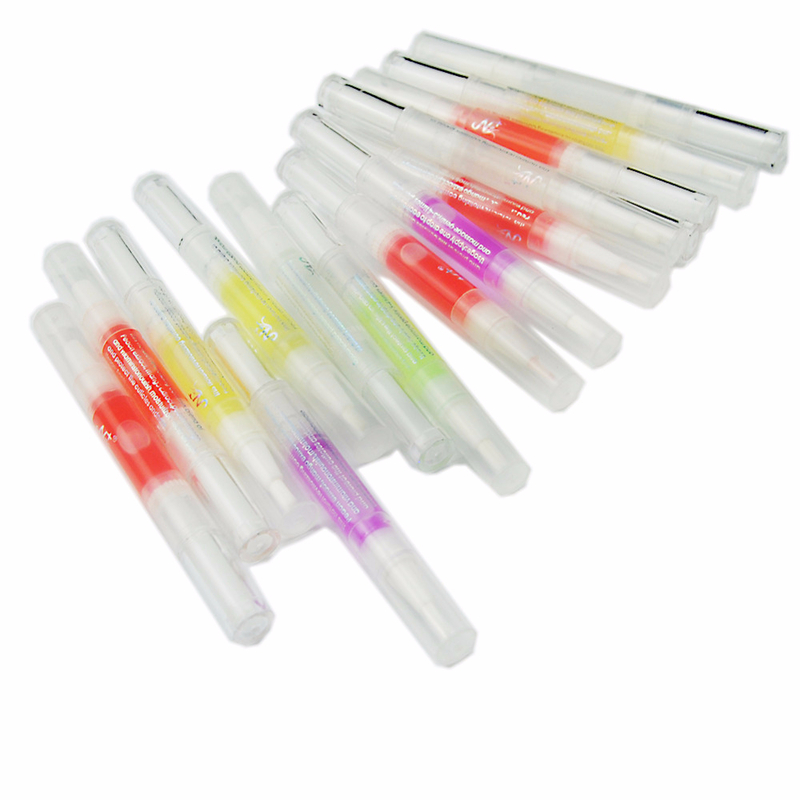 Among a huge number of medicinal plants, you can choose and plant exactly what you and your family need specifically. 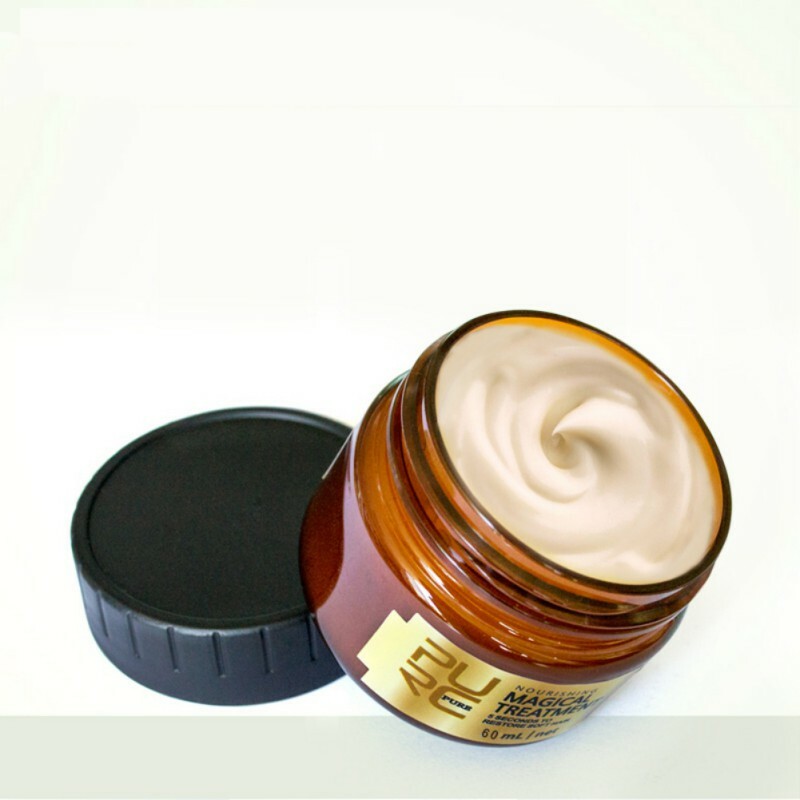 Tired stress, insomnia, increased fatigue - plant balm, mint, valerian, cyanosis, hops, oregano, thyme. Often there are colds - you can not do without Echinacea, St. John's wort, mother-and-stepmother, calendula, sage; problems with the kidneys - in the garden must necessarily grow strawberries, chamomile, dill, fennel, dog rose, nettle. And for cosmetic purposes, and all of the above, and yet - lovage, nettle, turn, celandine, flax, elecampane. The history of apothecary gardens and kitchen gardens began in monasteries. And practical considerations were always intertwined with higher religious meanings and were based on them. The gardens were supposed to look like a prototype of paradise, an ideal place for interaction between man and nature. Until now, "in the image and likeness" of the monastery gardens are arranged kitchen gardens: they make them round, broken into segments ("wheel"), or square with crossed paths and a bowl (pond) at the intersection. This is also a tribute to tradition (the circle is a symbol of the sun, and the cross is the main Christian symbol), and a pragmatic approach: it is convenient to place plants, take care of them and collect them. 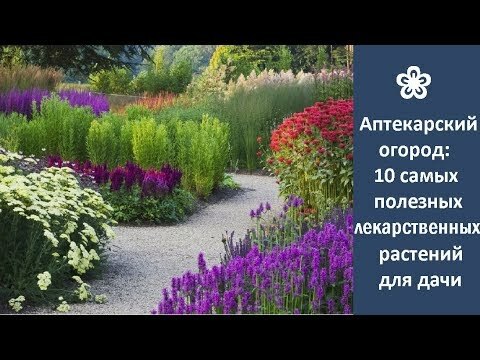 Of course, to adhere to these rules is not necessary, the shape of the garden or beds can be the most diverse - you are pulled along the path, triangular, free. It is convenient to grow plants in modules, dividing the plot into equal squares, some of which are tiled - so that it's easy to reach everyone. The pharmacy can be made in the form of a stony garden - it will perfectly look thyme, lavender, hyssop, sage, wormwood, decorative grades of oregano. You can arrange a spectacular flower bed or mixboarder. Fashion on the flower beds of natural style allows you to plant here a lot of beautiful medicinal plants: echinacea, oregano, sage, blood grouses, bastards, mables, cyanosis, monads, lungworts, elecampane, yarrow, lofant, cats, plantains, mountaineers, lavender, angelica, fennel, ammonia . If you do not use pesticides during their cultivation (and nearby), for family needs (medical, cosmetic or gastronomic), you can always pick a few leaves here, cut the branches (trim many for good), collect seeds, and when dividing and transplanting - take advantage of the roots of plants, without causing any damage to the beauty of the flower garden. Low spicy and medicinal herbs and semishrubs (thyme, larch, lemongrass, geraniums) are good as curbs along the garden paths. Such a fragrant path can lead to a secret medicinal garden, fenced off from the main territory by bushes of hawthorn, dogrose, elderberry, with an entrance, lined with vine of lemongrass or hop, and inside it - relaxing or invigorating flowers and herbs. The main thing is that everyone has enough light and heat (depending on the needs). Because most of them (lavender, hyssop, thyme, basil, marjoram, sage and others) come from the sunny Mediterranean. Although there are some that feel great on damp, slightly shaded areas (parsley, lovage, lemon balm, cats, mint), and they also need to create suitable conditions for them. The only thing that practically all medicinal plants do not tolerate is soil blocking. Therefore, an important condition is good drainage. In the lowlands and heavy clay sites, it is necessary to make elevated ridges and add sand. The place for a kitchen garden or a pharmacy bed is prepared in the same way as any other flower beds. 1. In the autumn it is dug and released from weeds. 2. In winter, the filling is considered, the number of plants required is calculated. 3. In early spring, they begin to cultivate seedlings, rooting cuttings, or purchase ready-made planting material. When the soil warms up, it is loosened once more and the weeds are removed. Then, mark out a plan carefully planned, plant or seed the seeds, taking into account the height, shape, color, nature of the growth of plants. Seedlings of heat-loving crops (basil, marigold) in the middle zone of Russia are planted in the ground only after the end of the threat of spring frosts. For medicinal purposes, plants grown in ecologically clean areas can be used. Using a medicinal plant for the first time, be careful: it can not only benefit, but also harm - cause allergies, burns, poisoning. 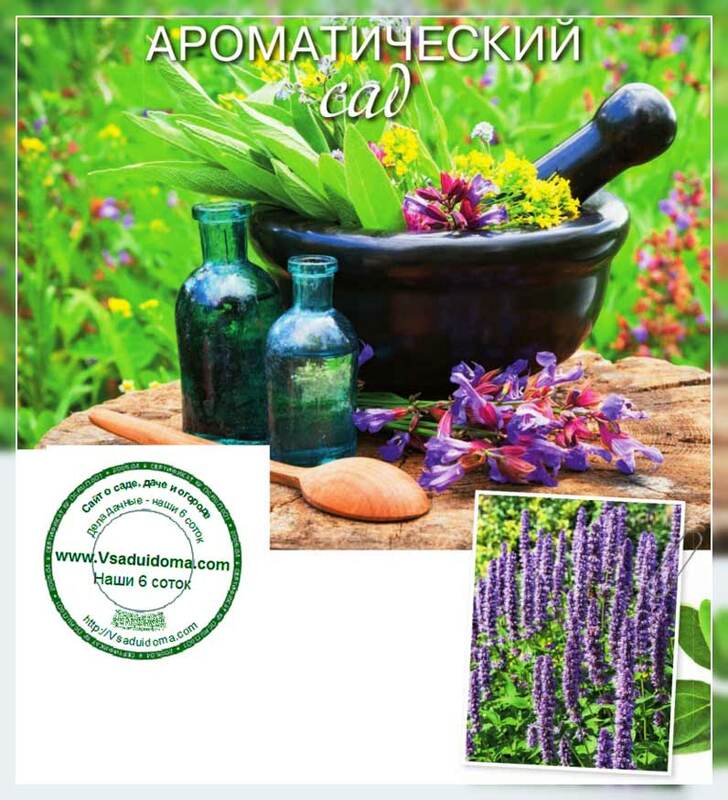 Among the medicinal plants are many deadly poisonous (aconite, lily of the valley, peony), preparations on their basis can be used only under the prescription of the doctor and under his supervision! Do not follow blindly advice, gleaned on the Internet or in any popular publications. Before applying this or that recipe with medicinal herbs for medicinal purposes, be sure to study in the literature special features of plants, possible side effects, time and methods of collecting raw materials, processing, storing and preparing, doses and timing. And even better - consult with a specialist. Many of the fragrant plants have decorative foliage and spectacular flowering. Since not all of them are equally winter-hardy and some of them are grown as an annual crop, it is advisable to purchase seeds for seedlings. This perennial fragrant plant is valued for the aroma of flowers, leaves, seeds, used in cooking as a spice, the leaves are added to tea. Overwinter with shelter. The plant will exude incense during hot midday hours, filling the air with essential oils and improving it. If you like its aroma, drop it off in places of rest, under windows, along the path, at the gate, on the porch. On the packages with its seeds, such names as “Mexican mint” and “Korean mint” are most often encountered; this is a multicolored Mexican and M. wrinkled, respectively. You can meet! "Name" lofant "," agastahe. " There are many varieties to choose from. You can sow in May immediately in open ground, in this case bloom in September. Sage has a delicate, gentle unobtrusive aroma, more noticeable when rubbing parts of a plant. It is optimal to plant with roses: it is believed that the mixing of their aromas is noble. In general, sage combines well with almost all plants that are similar to it in terms of its requirements for growing conditions. In flower beds organic w. oakwood Salvia officinalis is more suitable for aromatic beds (it is worth considering that it winters problematically). Among the annuals is interesting ethereal culture - w. spanish, called chia. Complement your aromatic planting with fragrant flowers. The time of their active flavor may vary during the day. So, petunia, mattiola, pelargonium, carnation, fragrant tobacco in the afternoon smell faintly; with the onset of twilight, their aroma intensifies, increasing by midnight. Lilies and roses actively exude scent during the day. Thus, the aromas of flowers can replace each other, filling the garden depending on the time of day. For the garden of great value is such a plant as wormwood. Today, the choice presented enough varieties p. Ordinary and p. Bitter. To love her is for what. Its leaves, which have a strong aroma, are used as a spice and flavor, it has medicinal properties, and is also good as an insecticidal, antibacterial and antimicrobial agent. It can be planted in the garden on a separate garden where it will scare away the pests of garden crops. (Just take care of limiting its growing rhizomes.) On the basis of wormwood, you can make infusions and spray the plants; crushed stems - mulch planting. For flower beds, the following types of wormwood are suitable: Schmidt, Stelle-ra. n. Louisiana and their varieties. Apart from the perennial species wintering in central Russia, is lemon citron, grown as an annual. It is interesting for its spicy harmonious aroma with lemon note. There are many varieties on sale: 'Mona Lisa', 'Lemon scent', 'Lemon Diana', 'Harlequin' and others, among which you can choose plants in height and tonus flowers. Seedlings are sown in April for seedlings. Plants bloom from July. Another aromatic plant - serpentine. The leaves are more fragrant than the flowers; with a slight lemon scent. In cooking use h. Moldovan, in another way it is called "Turkish Melissa." Types of serpentine about 40. More common h. Ruysha, h. grandiflora and h. foreign. In varying degrees, the citrus fragrance of foliage and flowers is inherent in all of them, although to a lesser extent than in s. Moldavian. The plant has healing properties. You can make baths, brew tea for a light lemon taste. In ornamental floriculture, one species is used - the n. Shrub Nanking, or the vegetable p. The name "Japanese parsley" is found. Has varieties with spectacularly colored foliage. 'Red mint' has the scent of coriander, cinnamon and citrus; the variety 'Rosinka' has greens with an unusual soft taste, in which there are tones of caramel, anise and pepper vibrato. Looks impressive in the flower beds, depending on the height, if you are not going to cut to the table. The leaves can be salted and pickled, and also used in dried form as an aromatic seasoning. specific odors (rosemary, valerian, marigold). When creating an aromatic garden is primarily to focus on their own preferences. Choose the main plant - I will accept the garden - and select an environment for it. The garden and the cottage > Useful properties of plants > Pharmacy garden with medicinal plants with their own hands - what to plant and how to equip?